RIKEN BRC has been permitted to collect and distribute bioresources developed using the CRISPR/Cas9 genome editing technology for academic research but not for commercial purpose by the Broad Institute of Harvard and MIT. We are looking forward to your deposition of CRISPR/Cas9 genome editing tools as well as request. Yoshimi, K., Kunihiro, Y., Kaneko, T., Nagahora, H., Voigt, B., Mashimo, T.
Nat. Commun. 7: 10431 (2016). PubMed PMID 26786405. RDB13130 T7-NLS hCas9-pA Cas9-poly(A) expressing improved plasmid. 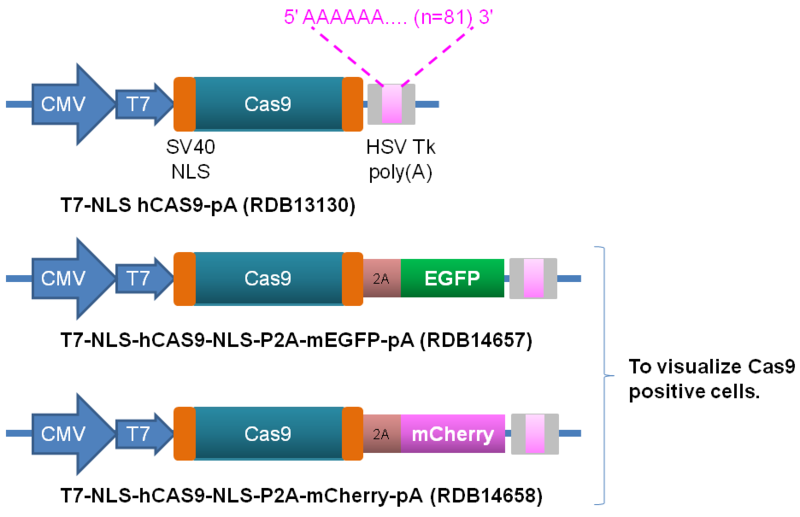 T7-NLS-hCAS9-pA is a plasmid for transcribing Cas9 mRNA with poly(A) tail allowing efficient Cas9 expression. Large-sized foreign genes were knock-in by introducing long single strand DNA together with the transcribed Cas9 mRNA into fertilized mouse and rat eggs by injection (Yoshimi, K. et al., 2016) and by electroporation (Miyasaka, Y. et al., 2018). RDB14419 T7-NLS-hCAS9(D10A)-NLS-pA Cas9-poly(A) expressing improved plasmid. RDB14420 T7-NLS-hCAS9(ver1.1)-NLS-pA Cas9-poly(A) expressing improved plasmid. RDB14421 T7-NLS-hCAS9(D10A_ver1.1)-NLS-pA Cas9-poly(A) expressing improved plasmid. RDB14657 T7-NLS-hCAS9-NLS-P2A-EGFP-pA Cas9-poly(A) expressing improved plasmid. RDB14658 T7-NLS-hCAS9-NLS-P2A-mCherry-pA Cas9-poly(A) expressing improved plasmid. A genome editing vector that enables easy selection and identification of knockout cells. Nagasaki, A., Kato, Y., Meguro, K., Yamagishi, A., Nakamura, C., Uyeda, T.Q.P. Plasmid 98: 37-44 (2018). PubMed PMID 30196057. RDB16763 pGedit Plasmid vector for high efficiency genome editing oligo DNA containing target sequence. Rapid protein depletion in human cells by auxin-inducible degron tagging with short homology donors. Cell Rep. 15 (1): 210-218 (2016). PubMed PMID 27052166. RDB13917 AAVS1 T2 CRIPR in pX330 A CRISPR/Cas plasmid for making DNA dounle-strand break at the human AAVS1 locus. Please visit the Auxin Inducible Degron (AID) System. CRISPR/Cas9-mediated gene knockout in the ascidian Ciona intestinalis. Sasaki, H., Yoshida, K., Hozumi, A., Sasakura, Y.
Dev. Growth Differ.56 (7): 499-510 (2014). PubMed PMID 25212715. RDB12994 pHTB Cas9 In vitro production of Cas9 mRNA. RDB12999 pSPCiEF1>Cas9 Expression plasmid of Cas9. It is important to design efficient guide RNA to obtain the success on genome editing. To solve a problem there are two vectors to evaluate a function of guide RNA. Generation of CRISPR/Cas9-mediated bicistronic knock-in ins1-cre driver mice. Hasegawa, Y., Hoshino, Y., Ibrahim, A.E., Kato, K., Daitoku, Y., Tanimoto, Y., Ikeda, Y., Oishi, H., Takahashi, S., Yoshiki, A., Yagami, K., Iseki, H., Mizuno, S., Sugiyama, F.
Exp. Anim. 65 (3): 319-327 (2016). PubMed PMID 27053096. RDB13948 p2color Genome editing tool for confirming the activity of CRISPR/Cas9 system. Generation of mutant mice by pronuclear injection of circular plasmid expressing Cas9 and single guided RNA. Mashiko, D., Fujihara, Y., Satouh, Y., Miyata, H., Isotani, A., Ikawa, M.
Sci. Rep. 3: 3355 (2013). PubMed PMID 24284873. RDB13532 pCAG-EGxxFP Validation plasmid for the effectiveness of guide RNA in CRISPR/Cas9 system. pCAG-EGxxFP developed and deposited by Dr. Masahito Ikawa and his colleagues at Osaka University (Mashiko, D. et al., 2013) allows you to evaluate the efficiency of genome editing by fluorescence intensity. First, insert the PCR amplified target sequence of genome editing into the EGFP gene in the vector. Next, transfect the constructed vector together with Cas9 expression and guide RNA expression vectors in animal cells. If your guide RNA works well, you will observe fluorescence of GFP, which is caused by the double stranded break (DSB) of the target sequence and restoration of GFP sequence. RDB16803 pCAG-NexxoR Selection plasmid for the positive clone of CRISPR/Cas9 system in the culture cells. Quantitative assay for TALEN activity at endogenous genomic loci. Hisano, Y., Ota, S., Arakawa, K., Muraki, M., Kono, N., Oshita, K., Sakuma, T., Tomita, M., Yamamoto, T., Okada, Y., Kawahara, A.
Biol. Open. 2 (4): 363-367 (2013). PubMed PMID 23616919.
pBR-lacZ alpha developed and deposited by Dr. Yu Hisano and his colleagues at RIKEN Quantitative Biology Center (QBiC) (Hisano, Y. et al., 2013) allows you to evaluate the efficiency of genome editing by the appearance of the blue/white colonies of E. coli. After the induction of genome editing, amplify the target region by PCR and insert it into the lacZ gene in this vector. In the case you amplify the target region in frame on lacZ gene and then carry out transformation with the constructed vector, if your guide RNA works well, you can observe many of white colonies on agar plate supplemented with X-gal, IPTG and ampicillin. An efficient system for homology-dependent targeted gene integration in medaka (Oryzias latipes). Murakami, Y., Ansai, S., Yonemura, A., Kinoshita, M.
Zoological Lett. 3: 10 (2017). PubMed PMID 28694996. RDB15409 pBaitD-gap43-linker-EGFP Donor plasmid for targeted insertion into the gap43 locus of Japanese medaka by the BaitD system. Precise in-frame integration of exogenous DNA mediated by CRISPR/Cas9 system in zebrafish. Hisano, Y., Sakuma, T., Nakade, S., Ohga, R., Ota, S., Okamoto, H., Yamamoto, T., Kawahara, A.
Sci. Rep. 5: 8841 (2015). PubMed PMID 25740433. RDB13480 pCS2P-tyr-mCherry-donor Donor vector for integrating mCherry into zebrafish tyrosinase locus. RDB13481 pCS2P-krtt1c19e-linker-eGFP-mut-donor Donor vector for integrating eGFP mutant into zebrafish krtt1c19e locus. Please refer Fig. 4 of Natsume, T., Cell Reports 15, 210-218 (2016) for an instruction about how to use these clones.